till about 80 % of the neck is resized. The last 20 % is your indication that you didn't touch the shoulders + it will help to secure the bullet when you don't use a crimpdie. This doesn't always work as intended !!! Sometimes the body of the case is being sized more than intended and the brass flows up towards the neck. When this happens it will cause the shoulder to increase the headspace dimension. The die must then be moved down in order to reset to the proper headspace. Yes, when you size your case with a Full Length die, if your die is threaded in enough to start sizing the case body (coincidentally at the pressure ring), the shoulder will be pushed upward toward the case mouth. It is like a baloon, squeeze it at the bottom and it will bulge out at the other end. With a dedicated Neck Die, this is not necessary and it will size only the neck. IMO, a Lee Collet Die is the best neck sizer. It does not need lube inside the neck and does not create any runout. It also will reduce the amount of working of the brass at the neck since you only size the neck once as opposed to squeezing the neck down with a regular die and then re-expanding it with an expander ball. Cheap to boot. Woods: nice drawing. It sure explains everything. Cabared221: maybe my age, maybe my english, maybe I'm just not clever enough, but I don't understand how brass that flew up can give more headspace. After being fired, the case normally has about the size and the shape of the chamber, so headspace is almost zero. When you don't push the shoulders back while resizing, how can one obtain headspace? I have tried to do this on different occasions and each and every time I've ended up with similar results. The picture shows measurements taken with fired cases and then re-sized with the die 3/4 turn backed out. Headspace was measured with a RCBS precision mic. Measurements were taken on the datum line of the shoulder, shoulder-body junction and half way down the body. As you can see the body does indeed receive a minimal sizing and the brass flows toward the shoulder increasing the dimension at the datum line where the headspace measurement is taken. The die needs to be turned down in order to reset headspace (push back down) so that the bolt will close. On my 7mm-08 the bolt is difficult to close with this set-up. The 6mm has more resistance than it should. IMO if you want to neck size it's best done with a die designed to do it. Brilliant explanation Chambered...so much so, methinks I might invest in a Lee Neck Size dies for my .243 and maybe 30.30 as well. chambered, that is all entirely possible. 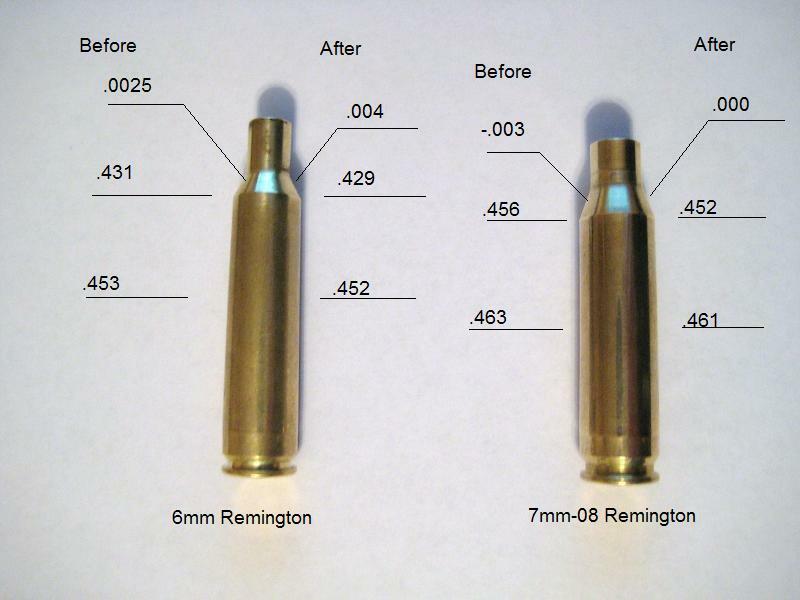 The operable word in your good diagram above is "Remington" (I am assuming your rifles are Remington also?). Even if your rifles are not Remingtons, then it could be said from your pics that both of those rifles have a "potbelly" as we are discussing which indicates a large chamber body. I reload for over 40 rifles, some of them Remington but not many. The few Remingtons I reload for all have a large chamber body, short shoulder (some so much that the die won't reach it without taking some of the die off at the bottom) and a long throat. Believe me, this is not normal in any other rifle I reload for and use Full Length dies. Most of my reloading is with the Lee Collet Neck Sizers and Redding Body Dies. This does not matter with this 2 die set up since you can size the neck and not worry about the case body or shoulder if you don't have a crush fit, or you can neck size with the Lee and then size the body and push the shoulder back with the Redding Body Die. Now, all chambers are differenet and when the factory starts using a reamer the initial chambers are much tighter than the ones done later with that same reamer and it is worn out and about to be discarded. Also, die dimensions are not consistant. But if you do a search or go through many of these threads on lots of different forums like I have, you will see that the general consensus (by far) is that if you want to Partial Neck Size then you back a Full Length Die up about 3/4 turn and it will not size the case body or move the shoulder. I'm goin with the Lee neck sizer. Thanks Chambered, you've redeemed yourself, to me. In your photo you don't show overall length, does that increase as well? or just the datum line width? A neck sizing die will do nothing to the brass below the neck, so the headspace will remain the same and the only real 'working' of the metal will be the neck, after the initial new brass is fired. That was my original statement.....I never said it don't work !!! Yes they are both Remington rifles and no, neither one has a potbelly. I have talked with numerous re-loaders on this subject over time and I'm amazed at how many have disagreed with my findings. As I start to question them on their knowledge and know how I quickly find that most of them have never owned or used a headspace gauge and they never thought to do any measuring on the body to confirm weather or not any sizing was taking place. So the question at hand would be, How many of those forum members have actually done some measuring with the proper tools ? I do have access to a couple of custom rifles and other non-Remingtons. I'll have to check them out when their owners are doing some re-loading. Thanks for pointing that out. By the way....how did you make that drawing ??? Suz, I left the OAL out because I thought it to be irrelevant but yes it will increase also. Full length resizing contributes to shorter case life. Bumping the neck back excessively probably does not make the brass flow back into the thinned area of the pressure ring, maybe if you added some heat. Full length resizing eventually makes the brass flow into the neck area, messing up the headspace dimension. You can full length resize to get rid of the pressure ring as long as the neck is not bumped back. Proper adjustment of the die seems to be the hard thing to accomplish. In doing a full length resize you actually are compromising accuracy, negating the positive effects of the fire-formed brass. But probably only brass from weapons, that need fire-forming, to be more accurate. You would also need to full length resize when the case as been through enough reloads to make it hard to chamber or extract, due to (I guess) loss of elasticity. Chambered!! What you said is actually stated in the Hornady 7th edition, possibly some people can't read, and that includes me, as I only glanced it over one time, but it's actually explained just as you did. They don't include any fancy measurements to bring the point home though. Well done! Some day I'll be a graduate, thanks to the people on this board that have the patience and knowledge to be such wonderful professors. Suz, don't add heat to that area, it is okay to anneal the portion foward but that is why you put them in an inch of water that and to quench them the alloy has to be just right for the properties to work in your favor. All things eventually wear out, I usually get tired of them before they do, but I've heard of people buying new brass. FN!! !I sort of said that as a joke, but I'll give you a freebee on that one because you stated that all things eventually wear out.....AND I TRICKED YOU INTO GETTING A NEW HAT!!!! Now if you could just change that avatar with the picture of you with a Stetson on!! OH yeah babay!! Need to work on Chambered too...that chicken eatin grin avatar looks silly...wonder if he has a hat? Thanks for that Suz...haven't actually done any research on that as yet. I don't load my cases to max pressure / velocity, so they fire form to my chamber nicely. You are correct when you say that "proper adjustment of the die seems to be a hard thing to accomplish". It can be a time consuming frustrating task, but once you have it adjusted correctly it should hold that adjustment until you have a need to revisit it. I will definitely be looking at getting a Neck Sizing Die for my .243 though. AND I TRICKED YOU INTO GETTING A NEW HAT!!!! I do believe it was I that started the hat thing !!! If ya switch to a hat like Bushy and Suz..........the western rig will look better !!! Oh? Yeah maybe it was...I thought I said something to him earlier than your comment on another thread, can't find it though. The thing is HE BOUGHT A HAT!!!! Gotta get rid of the Christmas avatar. He's got a great face for a Stetson too. How bout puttin a hat on your smiley face Chambered. A railroad hat would go good. One of those Osh Kosh rigs. Actually I have a photo of an Oshkosh campaign hat that would look good on yer smiley face, Can't figure out how to attach it to your avatar tho. It's nice and small, just needs to get on your avatar....common now, you can do that!